Sydney Shop Girl: The Weeknight Book Club - 'Primates of Park Avenue' by Wednesday Martin. The Weeknight Book Club - 'Primates of Park Avenue' by Wednesday Martin. Yep, I'm one of them. One of those people who jumps at the opportunity for a bit of a peek (and perhaps a pry) into the lives of those wealthy and impossibly perfect Manhattanites who reside on the Upper East Side of the city. Whether its a social commentary piece from the New York Times that's gone viral or a bit of fiction by Candace Bushnell, Olivia Goldsmith or Plum Sykes (for the British perspective), there's very little I wouldn't read when it comes to cultural critiques of the UES. The wardrobes, the extreme beauty and fitness regimes, the apartments and the glamour that seems to pervade every moment of every day: I know it's another world far, far from mine but I do like gazing upon it from afar. Not with longing, envy or wistfulness but curiousity. It all looks like it would take a lot of hard work, self control and constant anxiety to attain and then to maintain. Which is when I start to feel a wee bit smug and superior about my own life. About how it might not look as pretty and polished as the other half's it's somehow more simple, authentic, real and fulfilled. And how if I really, really, really wanted some facet of the UES dream, then I'd jolly well go out there and save my own money to make it happen on my terms. But what if you didn't have to get on that high horse and had the whole Park Avenue life presented to you as a right of birth, marriage or both? 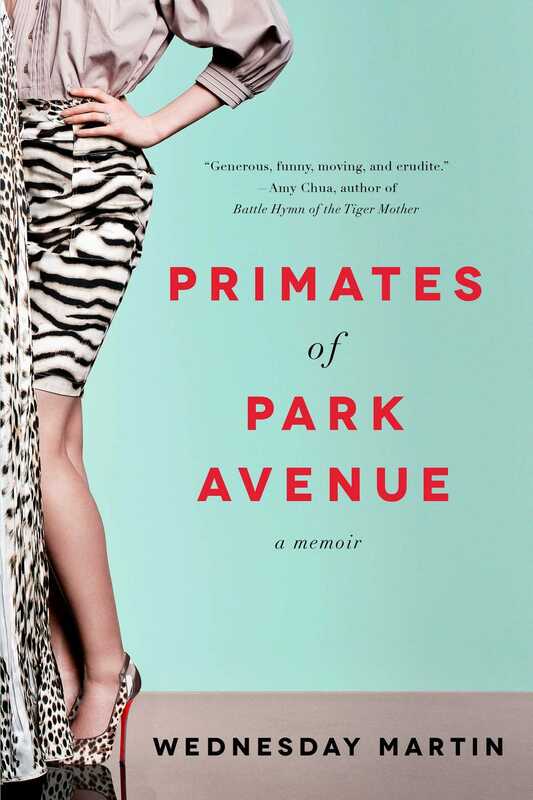 Would your life really be how Wednesday Martin portrays it in her controversial best seller, 'Primates of Park Avenue'? Martin is an anthroplogist who holds both an undergraduate degree and PhD in the field. She has worked both in academia and in the private sector. She is also a lover of fashion and has confessed to an overwhelming desire to fit in when interviewed recently about Primates. Which is all well and good and undeserving of anyone else's judgement. Except when you've written a bestseller about a clique you're attempting to break into and declaring it a memoir / anthropolgical study rather than fiction with thinly veiled references to reality ala Bushnell et al. In which case, you've let the games begin and opened yourself up to personal attacks and investigative reporting by publications such as the New York Times. Toddler SSG's copy of 'Urban Babies Wear Black' - a lovely gift Carly Findlay found for him on her trip to New York a few years back. As an introduction to Primates, Martin writes about the motivation and aims of her study of the women of the UES. It turns out that she too received a copy of 'Urban Babies Wear Black', a whimsical boardbook for babies outlining the almost stereotypically glamorous and curated lives of UES infants and their fashion plate parents. Martin recalls reading the book to herself (even whilst her son was asleep) and wondering just how she too would learn to become what she saw in the book. It wasn't just an idle daydream to the Mid West middle class raised Martin because she soon found herself moving to the UES with her husband (who comes from one of the area's well to do local families) and with a baby on the way. It sounded like a stressful and uncertain time for Martin personally with so much changing in her life all at once and perhaps this amplified her desire to fit and be accepted by the women of her new neighbourhood. 'Primates' alternates between descriptions of the UES written in the style of an academic paper (hopefully what I read as parody was intentional) and Martin's memoirs of her years living in the area. Of the two, I preferred the honesty and wry observations of the passages written in Martin's own voice. The number of Manhattan cliches Martin touches on would rival the shoes Carrie's shoe collection. A love of Lulu Lemon, the need to maintain a presence in the Hamptons, the strategy driven crusade to own a Birkin and the pressure to own the best apartments and to secure places at the best schools ... It goes on and on from one Manhattan-ism to the next. While I found it entertaining and absorbing in the context of fiction, it was unsettling to read a frank account of what it takes to make the UES life happen, especially when you may not have been handed it all in a silver spoon at birth. It seems to take both cash and connections to make this life happen and if you're a bit short on either, be prepared for an uphill battle. It would be easy for an outsider to wonder at the futility of it all. Does it really matter whether you prefer to do a fitness class on an exercise bike rather than at a barre (there's a whole chapter in 'Primates' about how the two are practically religions that dictate how you dress and behave during class and how you are perceived by those from the opposing fitness faction)? Why would you so desperately want your son to be friends with the children of people who seem to snub you? Perhaps if you find it all so odd then maybe that's a sign that it's a life not really meant for you. Not too good for you or not good enough for you, just not right for you. Martin and her family ended up leaving the UES to pursue schools and other projects outside of the area but not before the families of the UES did reach out to Martin herself when she was in the midst of a personal tragedy. I wonder how she was able to reconcile her publicly airing the details of their lives in a less than flattering light whilst also being able to share their kindness to her. People, wherever they may live, seldom conform to the generalizations made against them. They surprise us with kindness, compassion and empathy often when we least expect it. And I think this is where my unsettled feeling about 'Primates' lies. It makes generalizations about a group of privileged people that would provide a gold mine of entertaining material for a work of fiction but which do not stand up to the rigours of a semi robust, semi academic work of non-fiction. Which didn't stop me from reading 'Primates' non stop over a recent long weekend.... Martin writes well and 'Primates' isn't all as superficial and self absorbed as I might have made it sound. There are insights offered into how things got to be this way on the UES as well as commentary about parenting in the West in general. How did you feel about 'Primates'? Do you prefer your doses of the Upper East Side purely fictionalized or is factual more your style? Thanks for your insights and yes, I'm still going to be reading this genre for a very long time. I read this book only recently. At the start I found it interesting and intriguing but then I just found it sad. I had the same feelings when I read 'Primates' too. I understand Wednesday Martin has a previous novel out about being a step mother, not sure if it's fiction or in a similar vein to this. Never fear, I will get onto this and try and track it down on my Kindle. Truth is that every corner is very - primate like- it's just way more exaggerated in certain wealthy areas. I was intrigued at all the social rules of zone 2 Melbourne that one of my best friends go through!